Mila's Room: A room with large windows. 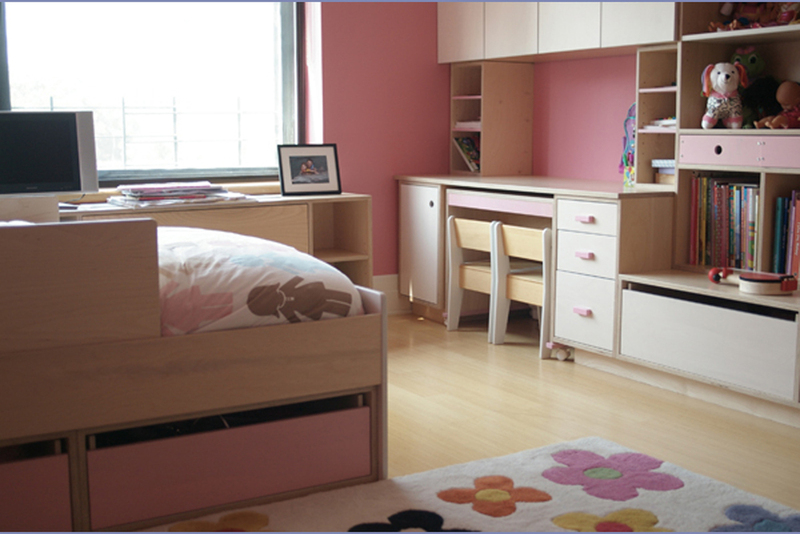 This room features a twin size bed with removable guard rails that the young child still needs. Along the wall opposite to the bed we installed a long cabinet with an integrated desk. Tucked underneath the desk is a nested table on wheels that can be easily removed. The lower height of the table is perfect for young children who haven’t yet grown into the desk. Once they do, taller chairs can be positioned underneath the desk. Beneath the window we built a shallow cabinet that also masks the radiator. The adjacent shelving unit is ten feet long and features a wide, multi-purpose bench. The bench is perfect for sitting as its height was designed for use with the removable table. A child can also use it as a stepping stool to safely access items on upper shelves. The drawers below provide children with easy access to toys and their proximity to the ground ensures that toys can be quickly and easily gathered and replaced when playtime is over. The featured products in this room are a Marino Twin bed, Modulor 59 Desk, Trundle storage drawers and a removable guardrail.